Windows Explorer, the default file browser of the Windows operating system, can display previews for select media files right in its interface. This only works for select display modes, and select file formats. While you may see preview thumbnails for wmv or mov files, you won't see previews for other popular file formats such as flv or mkv. A lack of supported formats make the feature less usable than it initially appears. Another issue that some users may have with the default media previewing is that it usually captures the first frame of the media file and turns it into the thumbnail shown in Windows Explorer. That's a big issue if multiple media files start the same. This is for instance the case if you have ripped a season of your favorite TV show from DVD to your computer. While those are the two most important issues you may experience in Windows Explorer, you may have also encountered smaller issues, like black thumbnail previews, or the inability to rename video files in Windows Explorer, even though they are not used by any visible process. 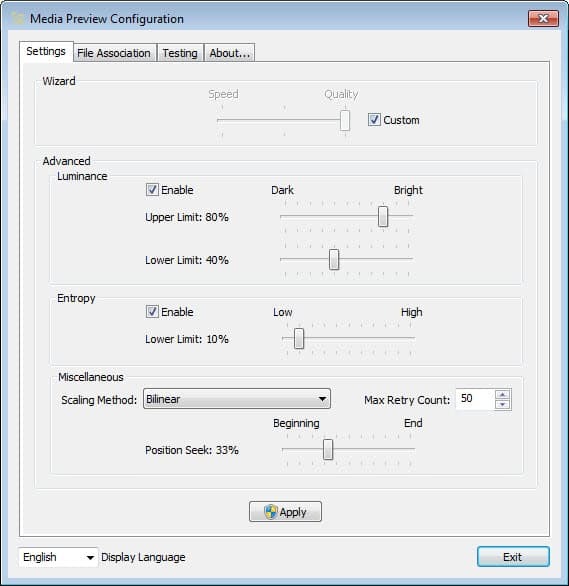 Media Preview is a third party software that resolves all issues mentioned above. The program comes in a 32-bit and 64-bit flavor, and compatibility with all versions of the Windows client system from Windows XP on. When you first start it you will be presented with a settings window where you can configure the program behavior. Here it is for instance possible to assign the thumbnail generation for select file types over to the program, or have it handle all media file types automatically. You can even add your own formats, and there is a good chance that they will be compatible with the program if they are used by media formats. Among the file types are 3g, Flash Video, Matroska video, RealMedia, avi and divx, as well as Ogg video or MPEG related file extensions. The program will by default use the highest quality settings available to render the thumbnail previews for media files in Windows Explorer. If you notice a speed bump while navigating folders with media files, you may want to change the slider more towards the speed direction in the preferences, or customize the thumbnail generation in detail here. Once you have made your selection, you should click on the Testing tab in the configuration utility. Here you can clear the thumbnail cache, or test the new feature by dragging and dropping media files into the target window to have their current thumbnail replaced by the thumbnail generated by Media Preview. If you do not like the thumbnail previews in Windows Explorer at all, then check out speed up Windows Explorer by disabling thumbnail previews. Will this work with windows media center recorded tv files? for some reason when i move recorded tv files to a network share the other media center computers don’t generate the thumbnail previews. Do you have any such thing that give very preview of PDF file in Windows Explorer? If yes pl share with reader. Remember, it is only for Windows 7. I have something that creates thumbnail previews pdf files but I don’t remember what I used but I’ll look into it. Hmm I couldn’t find it but if its any consolation I am using the latest Nitro PDF which may be the result of thumbnail views on pdfs. On another note if you all like nfo files and regularly view nfo’s and would like to have thumbnail views for that then I would recommend iNFekt, its a great little nfo viewer with loads of options and allows thumnails views on nfo files. I have to say that I’ve tried everything to get my media thumbnails back in XP Explorer and nothing worked……..until now. Thanks so much for pointing me towards ‘Media Preview’. It fixed the problem of the missing thumbnails.